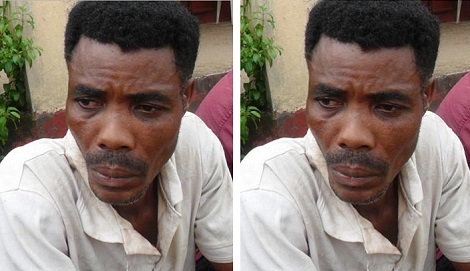 The Cross River State Police Command yesterday paraded a 52-year-old man, Udoh Abraham, for allegedly selling his two-year-old son for N150,000. Parading the suspect in Calabar, the state Commissioner of Police, Mr. Hafiz Inuwa, said the suspect was arrested on July 24 after the wife, Esther Abraham, reported the matter to the police. Inuwa explained that Udoh sold the child without the consent of his wife. He said upon interrogation, the suspect revealed that he sold the child to an unidentified woman residing in Uyo, Akwa Ibom State. Inuwa said, “On July 24, 2017, a case of child trafficking was reported at our Uwanse division in Calabar. “One Esther Abraham reported that her husband sold their two-year-old son without her consent. “Upon investigation, Udoh revealed that he sold the child at the cost of N150,000 to an unidentified woman residing at Uyo in Akwa Ibom State. Udoh, during a chat with Punch correspondent, admitted to selling the child for N150,000. “I sold the child because I needed money. I have six children and I am really sorry for not telling my wife about it,” he said. The commissioner also paraded 26 other suspects arrested by the state command for various offences committed in the state between June and July 2017.